﻿ Mobile World Congress Barcelona - Caricatures take the biscuit. 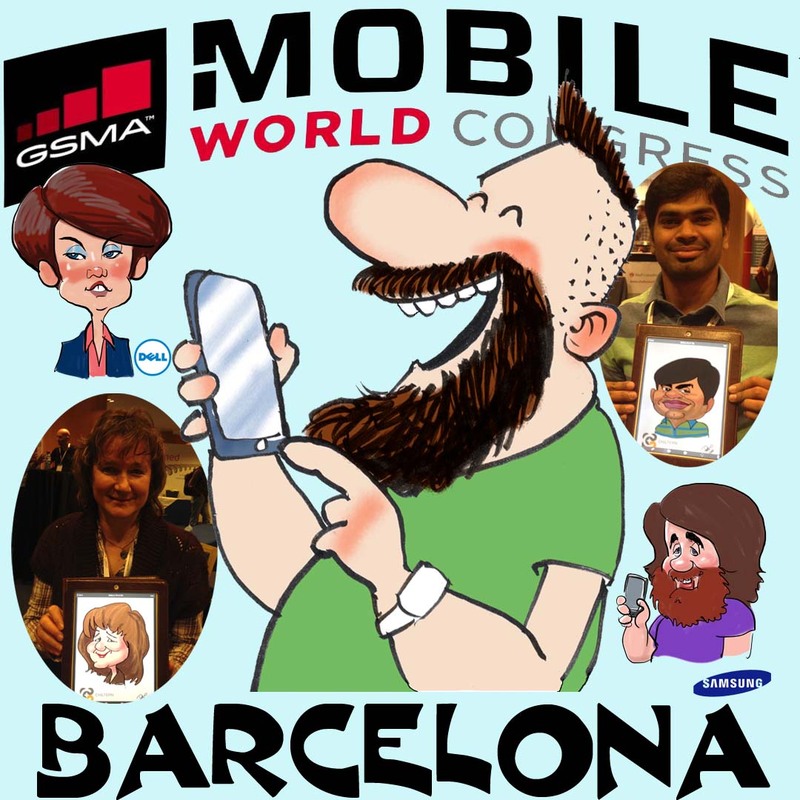 Mobile World Congress – Barcelona 2017 – What’s with the Caricatures? IT trade shows are interesting affairs with thousands of innovative ideas and products to inspire and bewilder even the seasoned professional. It is such a varied industry that there are very few who could understand all the diverse disciplines it encompasses. There is however one language that all of humanity understand, that is the funny caricature. I have drawn caricatures since well before mobile phones were ever thought possible. When the tablet first arrived with drawing capabilities there was great excitement in the cartoon world. Now it is possible to sketch from a huge range of devices and I have made it my business to help tech companies demonstrate their ever improving products whilst making their clients laugh. Delegates at a conference welcome the chance of a short amusing interlude from the serious business, and a trade stand offering quick caricatures benefits from the increase in trade. Ideally I would attract people to the stand by having my drawing device attached to a large display. Drawings (containing the stand owners branding) are emailed directly to the client from the device – meaning that the stand owner collects a healthy mailing list. They can also be printed out onto small cards (with branding) to display in the delegates lanyard. Delegates generally love to show their caricature to friends and colleagues long after the show has finished. Many share the image on social media. All the while the stand owner’s company branding is disseminated far and wide.